Cannot be destroyed by battle. Once per turn (Quick Effect): You can target 1 Attack Position monster; change it to Defense Position, also, this card can make a second attack during each Battle Phase this turn. Your opponent cannot activate cards or effects in response to this effect’s activation. Once per turn, when this card declares an attack on a face-up monster: You can activate this effect; until the end of this turn, this card gains ATK equal to half that monster’s current ATK, and if it does, that monster’s current ATK is halved. 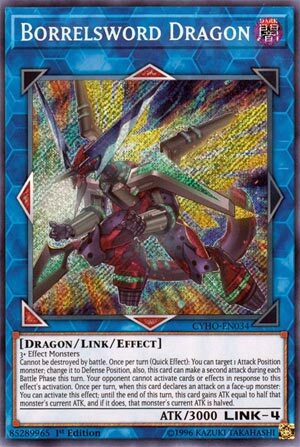 Borrelsword Dragon is the newest “Dragon” link monster to dominate the game. If your deck can make Link 4’s, play this. Scapegoat makes this card. Any Link 2 and two effect monsters of any level make this card. You get a 3000ATK monster, unkillable in battle that has an Enemy Controller effect and a Shrink effect every turn. Pure power personified. To end this week off, we are looking at the chase card of the Cybernetic Horizon set, Borrelsword Dragon. Borrelsword Dragon is a Link-4 DARK Dragon with 3000 ATK, points Up, Left, Bottom Left, and Bottom and requires 3+ Effect Monsters. 3000 ATK is never going to be bad, and so far there is no Link Monster with over 3000 ATK that I can think of. Needing 3 or more Effect Monsters is harder than some other Link-4s, but is easy to pull off with Link Climbing. DARK and Dragon is a good type/attribute combination. Borrelsword cannot be destroyed by battle, which shouldn’t matter too much with 3000 ATK. Once per turn, quick effect, you can target 1 Attack Position monster on the field and change it to Defense Position and this card can make a second attack during the Battle Phase this turn and your opponent cannot activate cards or effects in response to this activation. Well this is easy OTK potential, just switch one of your monsters that already attacked into Defense Position and let this thing have a second go in battle. This is meant to trigger Rokket effects, but many decks are using this card cause this effect gives so much OTK potential. On top of that, once per turn, when this card declares an attack, you can have this card gain ATK equal to half the ATK of the monster it is attacking and if it does, the monster it is attacking loses ATK equal to the ATK gain this card got. Even more damage potential for the OTK, what is great is that the ATK boost happens first so if the opponent is unaffected by card effects, this will still get a boost, only the opponent’s monster won’t lose ATK. Borrelsword is absurdly great for finishing a game off and is as staple as Borreload Dragon is already, both the Borrels mentioned are amazing. Art: 5/5 A dragon with swords is just terrifying. Borrelsworld Dragon…what a delicious way to end the week. Hell, I could have picked this week too, to be perfectly honest. (I didn’t). 3+ effect Monsters (which seems odd) but should be standard for most any Deck anyway. 3000 attack for a Link 4 is phenomenal, and the arrows are above/below and direct/diagonal left. Dark and Dragon, and those arrows are 75% good. All 4 to the main 4 zones, straight up, would have been too good. Anyway, to start, battle destruction is good. I find it odd to see it on a Monster with a 3000 attack body, but it’s still a GOOD thing. But wait, your opponent can’t activate cards or effects in response to that…this card is just screaming for OTK potential here. Oh, but because there isn’t enough Damage to be done here, you can also absorb half the attack of a Monster this card chooses to attack, while halving said Monster’s attack too. Good for a theme, and just as good outside, maybe a little too good on both sides. It’s very rare to see a card with no downside. The investment is steep at 3 Monsters, but absolutely worthwhile. Good luck with Borrelsword Dagon, you’re going to need it.